Pidta Jumbo Sorng B.E.2521, With One Silver Takruts Below. Teaches That Written On Leaf). 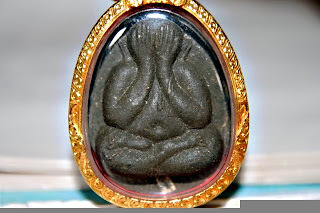 This black colour Pidta was made by Old Sutra Books.The Thais believe that amulets that made by Bailan (Sutra Leaf) had powerful protection in it. Grey Colour Pitda was made by Joss-stick Powder and the Thais believe that this Amulet can help them in avoiding Danger/Accident. heard only Nur Bailan was soaked in Holy Water. Chinnamon is the word used to describe amulets soaked in holy water. 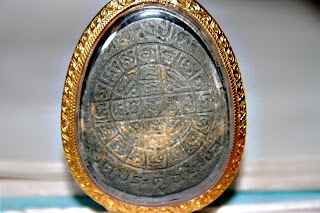 A thin layer or patches of fine powdery substance will be formed on the amulets, henceforth sometimes preventing close-up viewing on the actual material underneath. LuangPu Toh Wat Praduchimpree Pita Ngen Lan BE 2521. LuangPu Toh Wat Praduchimpree Pita Maha Setthee 2nd Batch BE 2521. Learn from this one. How can you verify Jumbo2 with yourself? 1) Siver Takrut must be yellow not white or black. 2) The like beside the right ear, try to remember its size. 3) The natural on surface, this is important which genuine should have it. For direct expert of LP.Toh amulet will have the point to verify genuine. Where is the point? Most important which can tell you fake or genuine is the beside of both edges has to be pressed because this point will be appeared when the stuff was taken from mold. The expert said this point can tel you fake or genuine 70-80% and we can notice that the edge and some material has been fold. The another 20-30% is the natural of oily material must be appeared around the amulet. You can notice that the new natural which come out the amulet will be white to yellow at first and became brown later and most import for all LP.Toh's amulet is looking wet. Don't forget thal LP.Toh's amulet never dry, it will look wet. That is all which save you from the fake. It is principle of its , don't against the principle and it nature.